Last weekend, Kathie and I took a Williams & Sonoma cooking technique class, and afterwards, as you usual, we explored downtown Los Gatos for a little bit. On this trip, we discovered a wonderful little store called Vintages of Los Gatos. I love that store...they had lots of wonderful things! 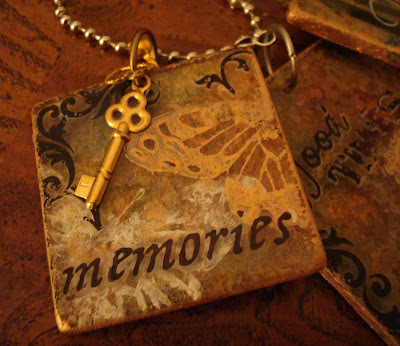 I even found a couple of very old photo albums – one was from the 1800s and came from Paris. I’ll be doing some sort of altered art with those–eventually. Another little purchase I made there was the cutest little broomstick that was made by the owner — a very simple design with a "happy halloween" tag attached to it. Adorable! And, it was the last one. 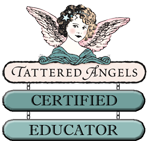 It was so cute, I decided to make more of my own to give to the ladies that attended my class this weekend. Last month, when I taught the halloween haunted house class, Kathryn made some fabulous pumpkin cupcakes for me to bring for everyone in class. They were yummy! Unfortunately for me, Kathryn has been very busy with homecoming this week—so no cupcakes for this weekend’s classes. Instead, the ladies got broomsticks! For Saturday’s class, the "charming" broomsticks were a bit on the larger size so you can do various things with them -- maybe hang a small halloween sign or vertical banner. I also thought the larger broomstick would look nice on the haunted house we were making, and a couple of ladies, did incorporate the broom onto their house. I wish I had my camera with me - it was cute! For today’s class, I made candy-pull wrappers, put a chocolate bar inside, and decorated the top with a vintage halloween image, attached a witch charm from ACharmingplace, and attached the broomstick. Not as yummy as the cupcakes, but still cute! Wow, another post in the same month! 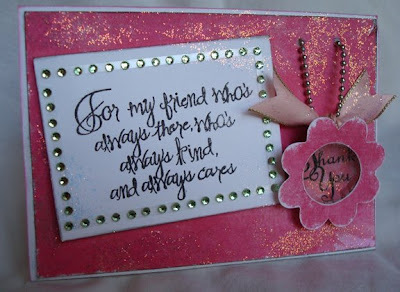 Nothing fancy, just a card for a friend using scraps of paper from my dream banner class, some Rock Candy Stickles, and a filigree charm from ACharmingplace. I made the little flower from some seam binding. Tomorrow, I'll post some "charming" broomsticks I've made for the ladies that are taking my Eerie Halloween House/Album tomorrow. Wanted to share an altered box I made for a box swap I was in. Our little "drama queen" group drew names for this swap, and I drew Kathie O’s name. I was happy to have pulled her name because I thought it would be a little easier to figure out what she likes since we often go on "inspiration journeys" together. I know Kathie will like everything I put on her box...I know this because we both were drawn to and bought the same things while on these inspiration journeys! But I’ll bet Kathie’s shells are sitting in a box somewhere in her craft room...my shells are in a box too...one made for Ms. Kathie. and turned it into this shadow box...I hope Kathie likes it. Here's the "shadow box" portion. I made it with foam core and covered the ugly edges of it with ribbon. my absolute favorite part has to be the octopus! It makes me giggle every time I look at it. I bought the octopus (and the majority of the other shells too) from Tangerines in Dublin. Gina Gabriell, the owner of Tangerines, also makes beautiful art dolls — she even makes the eyes and sells them! I think they are amazing! I bought one of the smallest pairs she had and attached them to the octopus...Kathie loves body parts...I think eyes qualify. "Before" and "After" Pictures of My "Thong"
Remember this "before" picture of "my thong"? You know, the "weird stuff" that was sent to me for the "thong" challenge I posted about HERE? Well, here’s the "After" picture of what I made from the "weird stuff." The industrial green and red wires, mica, tag, ball chain, wooden circles, and resistors were all incorporated into this layout. When we do these challenges, everyone tries to disguise their "style" and anything else (like backgrounds) that might give your entry away. I haven't made a "12x12" layout in forever, so I thought now would be a good time. And it was so hard not to add distress ink to anything--which is something I always do. I also didn't want to use a picture of my own kids, so, a big thank you to my friend Ruth for letting me use the picture of her beautiful grandchildren for this challenge! I used everything that was sent to me...and here’s what I did to the stuff. I twisted the industrial red and green wires together and then put them through my paper crimper. They were still ugly so I colored them with alcohol ink and a gold Krylon pen and used it as a frame for the picture. 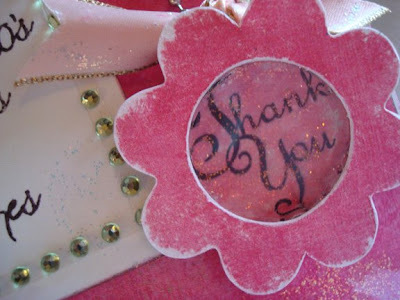 I painted the ball chain pink, formed an "L" with it and adhered it with Glossy Accents to one of the mica pieces, which I had peeled and split into three pieces. For three of the resistors, I formed a circle with them and placed it on top of one of the wooden disks. 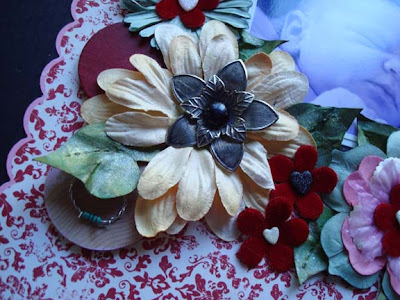 Both disks were added to the bunch of flowers. I added my own junk to the layout...the metal flower center is from a pair of earrings I got at an estate sale for $1.00. 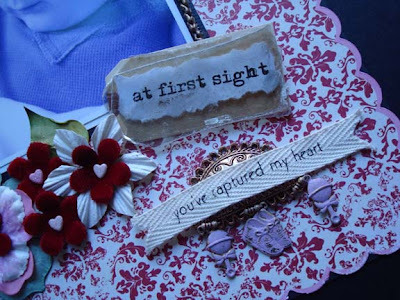 I sandwiched the typed words "at first sight" between the remaining two pieces of mica and layed it on top of the tag that was sent. The other three tan resisters were used to hang three painted baby charms from ACharmingPlace.com from the loops of that big ol’ button I received. I covered part of the button with printed twill because it was kinda ugly! And here’s what the eleven other creative ladies did with their "thong" — so fun and so much creativity! 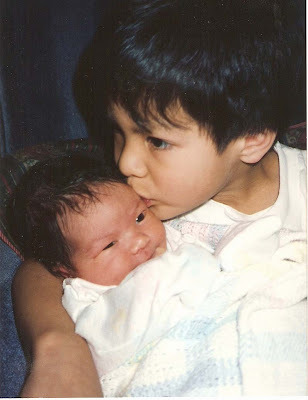 It seems like just yesterday when my youngest was born (the one being kissed by Joey in this picture). Kathryn went from wanting a big "Lazertag" party at the beginning of the year, to wanting just three of her closest friends over for a sleep-over. They had a great time together! 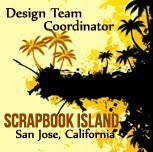 Kathryn and I had some WICKED fun last night with 18 other "crafty" ladies from Scrapbook U! Monica, the owner of Scrapbook U, arranged for all of us to have dinner, then travel on BART (which was right across the street from the theater!) 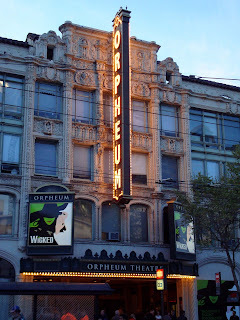 to see Wicked at The Orpheum Theater. It was an awesome show, and to see it with friends was especially nice. I’m ready to see it again! I doubt I will ever catch up to Monica, who has seen it eight times now! Good thing I posted two things on Thursday because I didn’t get to "play" on Friday because I was prepping for class. Didn’t "play" today either because I was teaching. 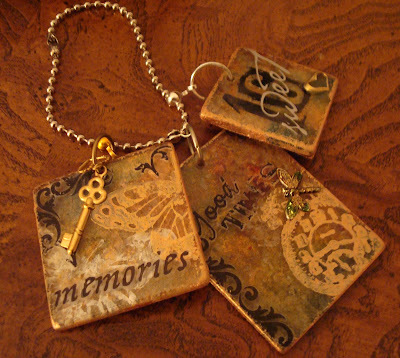 Second -- a paper mache letter that I covered (both sides) with embossed metal and added layered charms from ACharmingPlace. Hopefully, I will play on Sunday! Don’t fall over...but this is two posts in one day! After working on my "thong," I received inspiration today via email and snail-mail. In the mail, I received a couple of gold butterfly and flower sticker sets from Helena. She sent them to me as a little prize for answering one of her questions in bingo last month on ACP. 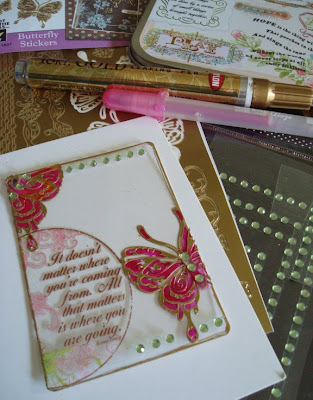 I made an acrylic ATC and used a Sakura Glaze pen to color in the butterfly stickers, a rub-on by Rhonna Farrer, Heidi Swapp bling, and edged the ATC with a Gold Krylon pen. 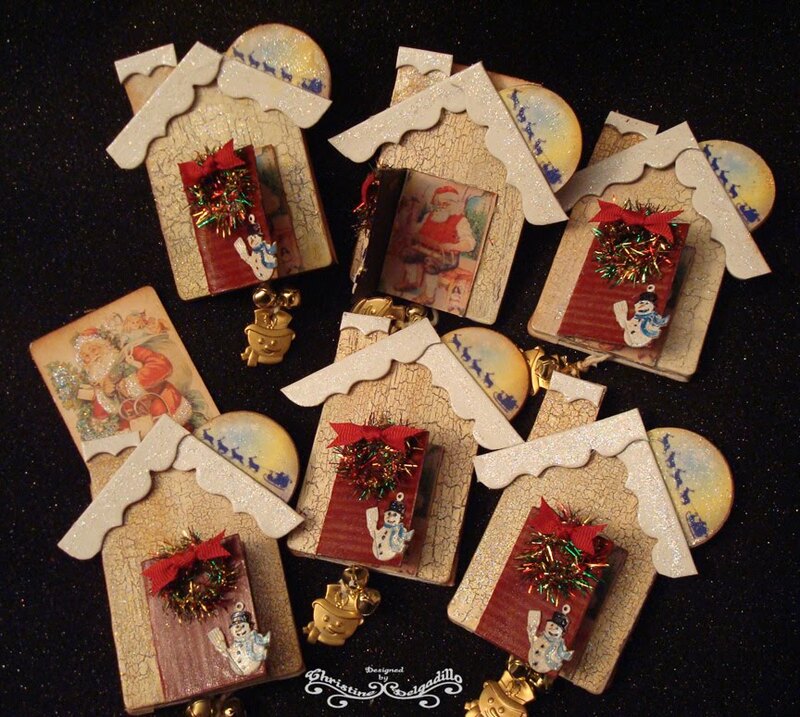 In my email today, I received Julia Andrus’s newsletter which had a couple of free downloads for some vintage bottle caps. 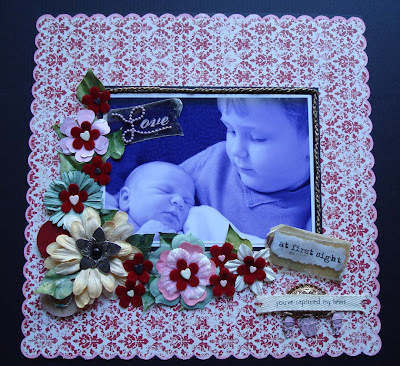 She is also having a Spring Challenge so I used one of the downloads and made this entry. You can find both the bottle cap download and the Spring Challenge information on Julia Andrus’s website. Today I will be working on my "thong." Here’s a picture of the items I received in my envelope: wires, ball chain, two wooden circles, a gold embellishment, resistors, a tag and some mica. A little history...a few years ago I started a challenge called, "Mystery Double Dog Dare" (MDDD) where I mailed those willing to take the challenge, a mystery object that they had to make something out of. The item I sent everyone was a four slot microscope slide holder. In all of our joking around, somehow the "mystery object" I mailed everyone ended up being referred to as a "thong"–and the nickname has stuck ever since. All the "thong" entries I received were very creative. This month, Leah is hosting the MDDD at ACP, and this is the "thong" she sent everyone. So now I have to create something from all, some or just one of these items. We can do anything we want to this thong...rip it, cut it, slice it, dice it, rearrange it, turn it inside out, ink it, whatever....we get free reign. After we alter the thong, we send a picture back to the hostess and she anonymously posts everyone’s entries. Everyone then tries to guess who made which thong...and there are various prizes for those with the most correct guesses, least correct guesses, etc. Very challenging but fun! I spent today holding down the couch–still sick. But after dinner I decided I’d try something quick that I could post on my blog for today. 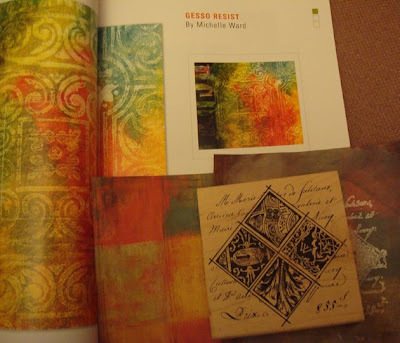 I pulled out my copy of Somerset Apprentice to try Michelle Ward’s Gesso Resist. I have gesso, in fact, I think I have two bottles of it—neither of which I could quickly find. I seriously need to organize my room again. So, instead of gesso, I substituted a Pearl Dabber by Ranger because I know the dabbers also act as a resist. 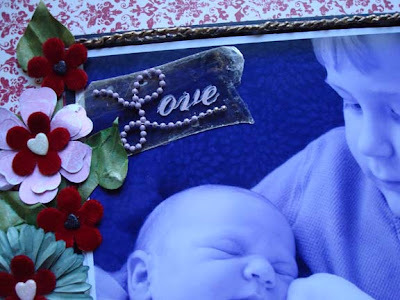 When my paint stamped image was dry, I painted over it completely with some Making Memories metallic emerald paint, misted it with water, and then wiped off the paint. Here’s the Somerset Apprentice article, the paper I started with (lower left-old basic grey paper) the Stampers Anonymous stamp I used, and under the stamp and to the right is what the paper looked like after it was stamped and painted. 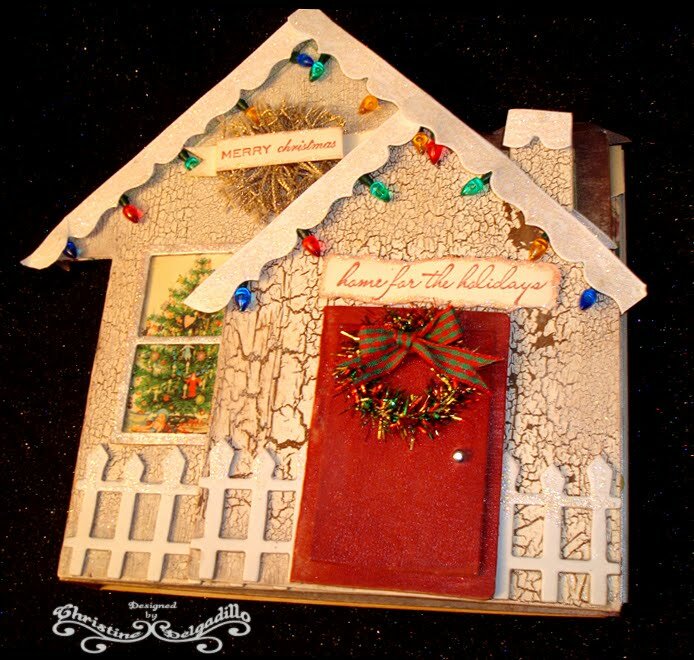 I stamped one of Tim Holtz’s Natural Beauty stamps onto a transparency using Adirondack Pitch Black pigment ink, quickly heat set it, and used Glossy Accents to attach it to the ATC background. 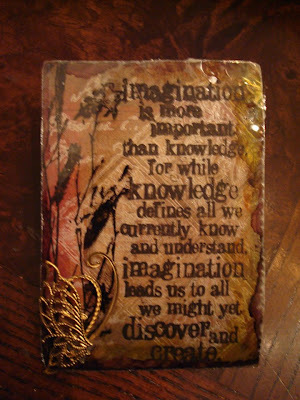 I stamped the quote (from the same stamp set) onto a piece of mica using the pitch black ink and heat set it as well. I attached the mica to the transparency with glossy accents. Alcohol inks were used to edge the mica, and I used a half of a butterfly charm and swirl charm (from ACharmingPlace.com) for an antennae. So...that's three days in a row of blogging...I hope tomorrow will be four days in a row! Feeling sick today but still managed to get in some play time. I made an ATC using Glimmer Mist, UTEE, Perfect Pearls and a Paint Dabber. The last one I made like this (here), I sent it to Leah. This one I’m going to keep for myself. The butterfly and swirl charms are from ACharmingPlace.com. 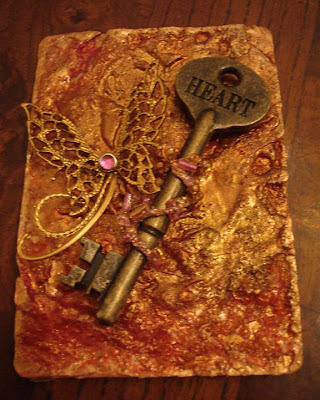 The Heart key is from Tim Holtz’s idea-ology line. 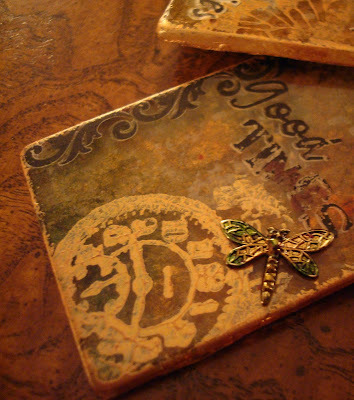 I stamped into the Glimmer Mist/UTEE background with Tim Holtz’s Baroque stamp. I just love all the texture in these things! 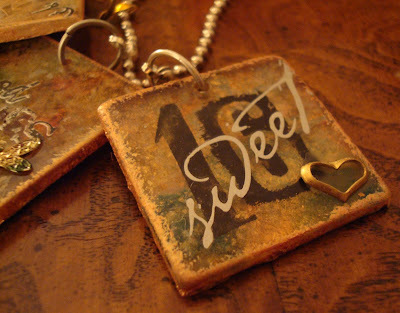 Hard to believe that tomorrow will be three months since I last blogged. Time flies, and not all of it was having fun. But, there were definitely some fun parts, like going to CHA with my daughter and visiting with the ACP girls in Florida. Fast forward to today...I played! I started off wanting to make some crushed mica, but when I couldn't find my pasta machine (I am sure it is lost forever in the garage), I tried to find something else to crush the mica. It was quite the experiment! FYI, a rolling pin doesn't work, neither does a hammer, and neither does a paper crimper! After putting the mica through all of the above abuse, I ended up just using my scissors on it. I was quite amused that you can actually crimp mica with a paper crimper! But it didn't crush it...that stuff is tough! Anyway, the mica crushing experiment was pretty boring, it even looked boring after it was crushed. So I took out the alcohol inks and perfect pearls to color the mica, and things started happening...and not much of it involved the crushed mica. But THESE...were my absolute favorites! I think they'd make a fun class!